Search Engine Optimization (SEO) is more than just inbound marketing. There is a technical side of the SEO often gets neglected, especially if you are a casual follower of the industry. 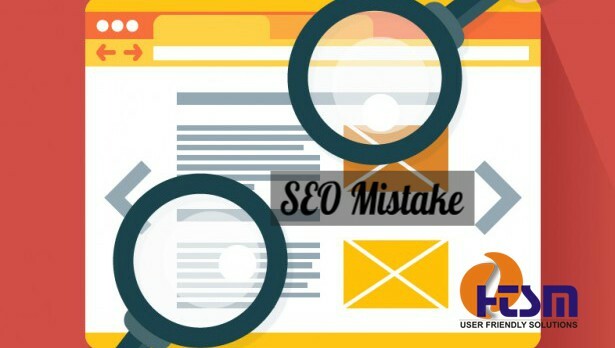 We at HTSM, being one of the leading SEO service provider have identify some common On-Page SEO mistakes you must avoid. It is important for you to have the right URL structure. URL architecture can be a difficult thing to fix without affecting the other aspects of SEO parameters. So it is recommended that you do not rush into the same. Hurrying to fix this issue may do more harm rather than good. You may also have situations in which you have URLs with no folders other than the parent domain. While this is precisely the form your most important pages should take, pages further down the hierarchy should be listed in folders to categorize them. should be treated as “Canon” by the search engines. The purpose mainly is to prevent duplicate content from getting indexed. If this is not done then it could result in your search engine result getting diluted. If you are to look from a stand point of pure Page Rank standpoint, external links dilute the authority that gets passed back to your own site. By this we of course do not mean you should not be linking to anybody else. However at the same time you must realize that outbound links in your own site navigation compound the losses by affecting every page. You must also note that search engines have come a long way since the original Page Rank algorithm. But if the quality of outbound links that are not relevant it might easily look like Spam. Before using them therefore scam they for quality. Quality out bound links which enhance user experience is important for SEO. However if you are not using enough outbound links you may be missing out to boost your search engine rankings. You must ensure that you have the internal link structure for your website. You need to build your website with a very logical link structure. The thumb rule for internal linking is that every page should be reachable from at least one static link text. Where ever possible you must avoid using images instead of texts. The reason is that it is difficult for search engines to interpret images instead of texts. So images are important , but at the same time you should know how to use them more effectively. It is quite amazing to note that there are many websites which do not have meta descriptions. Having appropriate meta descriptions are critical for SEO success. So you must use the same effectively. On the other hand you must also avoid creating duplicate meta descriptions for your web pages. This has an adverse SEO impact. It is true that Google Crawls and indexes websites are much faster as on date than what they used to be in the past. This probably the reason that many websites do not make use of XML site maps these days. But these are still valuable since they help in indexation process even on date. So make use of XML Site maps. You need to realize that H1 is to serve as the Page title. So you should not use it as a Subheading. If you do the same the Search engines often gets confused. You should not use sub headings inconsistently. For e. g you should not skip H2 subheading and go on to H3 Tags. Though certain correlative studies definitely point to use of keywords in bold formatting having a positive relationship with rankings, it is very easy to interpret these results in the wrong way. So you need to use these wisely to ensure better SEO performance. In conclusion we hope that we have been able to provide you with a fair idea about the common mistakes one makes on on-Page SEO. So you must be sure not to make them. For more tips about SEO tips keep following Search Engine Land. If you are going spend your summer in campus, this useful advices may help you to learn a lot about it. It was really helpful for me. I would like to see even more info. I want to avoid these mistakes at any cost. It's really important. It's really helpful. Thank you so much. I can study many things from your blog. I won't make them. Now I am informed about all of them. Post this article https://essayclick.net/blog/buying-essays-online here later.